I watched The Blaze’s For The Record this week, with the episode entitled Blackout. I am increasingly impressed with this show and would highly recommend it to those seeking actual fact-based news. I will also be watching National Geographic’s docudrama American Blackout tonight. I can already tell you that show though, is flawed. They have radically underestimated the number of dead in America after an EMP attack at less than 2,000. That’s laughable. Just car crashes alone would result in far more than that. For The Record estimates over 50% of the population of the US would die in the first year according to the Congressional EMP Commission. And it could be many, many more. The book’s premise sets the stage for a series of “die-offs”. The first takes place within a week (those in hospitals and assisted living). After about 15 days, salmonella-induced typhoid fever and cholera set in from eating tainted food, drinking tainted water, and generally poor sanitation. Americans have lived in an environment of easy hygiene, sterilization, and antibiotics, making them prime targets for third-world diseases. The lack of bathing and poor diet will lead to rampant feminine hygiene infections; deep cuts, rusty nail punctures, and dog bites go untreated with antibiotics, tetanus shots, or rabies treatment as more die from common infections. Critical medical supply and food thieves and others are executed in public as enforcement of martial law. In 30 days, cardiac and other drug-dependent patients die off. In 60 or so days, the pacemaker and Type I diabetics patients begin to die off (although John’s young daughter manages to survive until Day 131). The 5% of population having severe psychotic disorders that no longer have medication will re-create bedlam. Make-shift wood-burning stoves lead to carbon monoxide deaths and fires that cannot be controlled due to the lack of a fire department. An Electro Magnetic Pulse, or EMP, is a high-intensity burst of electromagnetic energy. 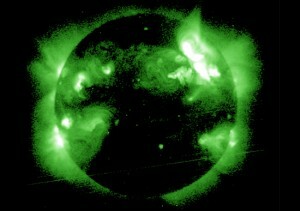 This can occur during a massive solar flare or more likely, as a result of a nuclear bomb set off high above America. As an example, it could destroy approximately 74% of our electrical infrastructure if set off above Cincinnati, Ohio, according to one study. Now consider if more than one were set off high in the sky. It would be lights out America and we would be thrown 150 years backwards in technology in the blink of an eye. Once launched, a long-range ballistic missile equipped with a nuclear warhead intended to cause an EMP can reach the United States in as little as 33 minutes. Having a comprehensive, multilayered ballistic missile defense system is one way to mitigate this EMP threat. Yet the current missile defense budget has been reduced by $500 million to $9.2 billion for fiscal year (FY) 2014—and this doesn’t include sequestration. Heritage has estimated $11 billion is needed to adequately fund the U.S. missile defense system. Multiple senior US officials on both sides of the aisle have warned on this threat. It is not a matter of if, but when. We shouldn’t have to discuss this. To harden the civilian grid, which 99% of the military rely upon, would cost $500 million. Considering our spending habits of late, that would be a pittance and well worth it. Cut back on a few royal vacations and some Progressive pork and voila! You have infrastructure security. If an EMP was detonated over the Eastern Seaboard, the estimated costs today would be around $800 billion in infrastructure assets. That doesn’t include loss of life. Think about this as well… we no longer manufacture the huge electrical components for our grid – transformers – here in the US. It would take one to two years to replace one and it would have to come from Germany, Japan or South Korea. If there was ever an argument to bring manufacturing home to the US, that one alone would be it. 9-11 was a wake-up call. As horrific as it was, it was just the opening salvo to much more grandiose terrorism plans. Our leaders are sitting around acting like everything is fine… Either they are deaf, dumb and blind, or they just don’t care. As far as Obama goes, he knows what could happen and I think he hopes it will. You see, Russia and China have already protected themselves from this catastrophe. You have to ask yourself why we haven’t. Why are we playing Russian roulette (and I do mean Russian) with our life’s blood as a country when for a proportionately small amount, we could protect ourselves? Why, unless someone intentionally wants us exposed. I think we already know the answer to that one. HR2417 – The Shield Act – is now before Congress and in Committee. The two leaders in the US Congress trying to get this rectified before we are all toast are Trent Franks (R) out of Arizona and Yvette Clarke (D) out of New York. The bill not only calls for making the electrical industry responsible for hardening the electrical grid, it calls for items such as massive surge protectors to be put in place. There is no agency overseeing this threat. The DOE does not oversee it. EMPs are the ultimate asymmetrical weapon and Russia, China, Iran and North Korea will use them. Before it’s Lights out in America and we face an invasion from our enemies, perhaps we should at least attempt to protect our country from the existential threat of EMPs.